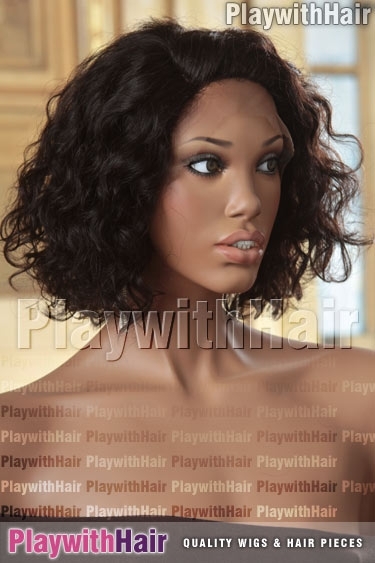 Eyecatching, bold and bouncy - This hot new lace front style has it ALL!!! ! Heaps of of tousled shaggy midlength layers, and a mono side parting for a nice natural look - This wig is SO cute, bouncy and soft! The Brazilian Remy Human Hair used to make this wig is SO soft, silky and absolutely stunning!! You can cut, heat, style and gently colour this wig with ease, it really DOES have the most amazing soft texture. To achieve the look in the photo you WILL need to style the wig using heated tools like a hairdryer and some spray products, and depending on your face shape it might require some attention from a professional hair stylist to ensure the wig looks perfect on you if you're not confident with basic stying! This great style has a lace front hairline for a natural appearance - It looks like the hair is growing out of your head! The lace you can see on the front of the wig is designed to be customised by cutting back the lace to the hairline for the best effect. The cap is an adjustable average size, for a comfortable all-day wear - Get it while it's hot, this style has been SUPER popular and we have limited stock! naturalblack Natural Black Brown Mix This tone is called NATURAL BLACK. It's unprocessed remy hair, so it has a blend of natural colours, including browns and reds mixed in.